About 10 years ago, a call came in from one of the many volunteers who work with the Soroptimist organization in our area. Would we be willing to provide a website for their annual fundraising event ... A Chocolate Affair ... that raises money for women and children in the community who are in need of help? We were happy to say "yes" to this request. 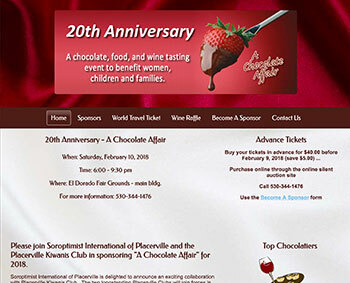 This year (2018 20th anniversary event), the Soroptimist International of Placerville is joined by the Placerville Kiwanis Club to bring you the 2018 A Chocolate Affair. It seemed like a good time to bring a 10 year old website into the modern age where it can be viewed on many different digital devices. If you'd like to do business with a company who feels it is important to help out where possible, contact us. We hope you enjoy visiting the website whether it is from your computer, your tablet, or your phone.